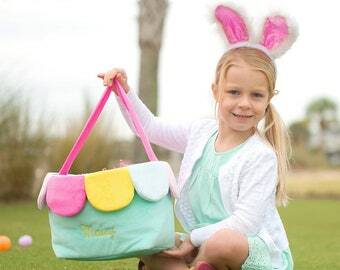 These cute Easter baskets will add the perfect touch to your Easter morning! These baskets have two available trim options- navy blue and pink. They will want to keep this basket out all year long. 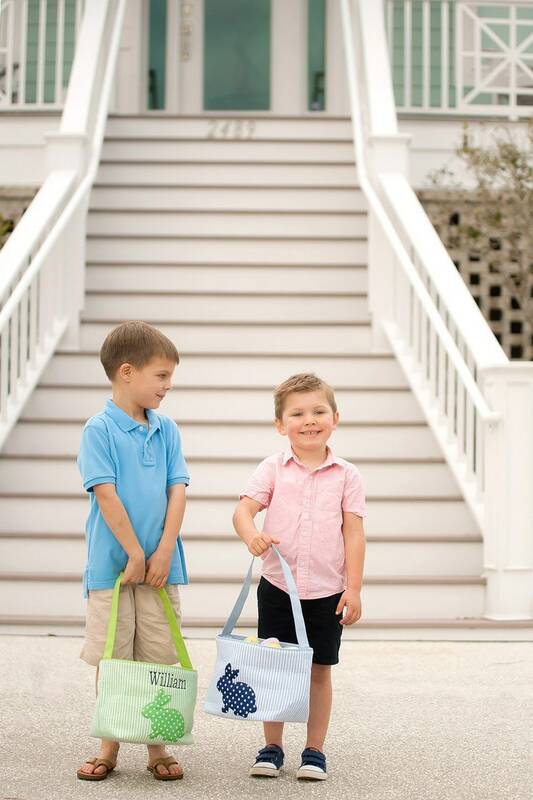 This basket has plenty of room to carry Easter eggs or fill with gifts from the Easter bunny! Fold flat for easy storage. 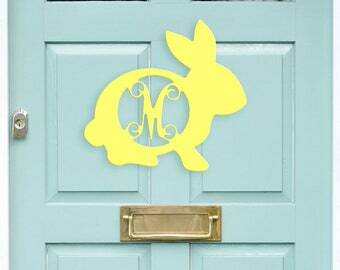 This listing is for one basket with a monogram or name. Please let me know if you have any questions. Thanks! 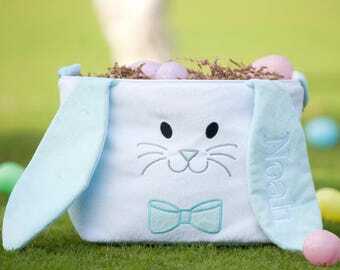 This is the cutest Easter basket! I can’t wait to fill it with goodies year after year! I love our new Easter basket. Great quality and exactly how I asked for it! It was also delivered very quickly. We accept PayPal or credit cards. We do not cancel orders since all of our orders are customized. If you contact us within 24 hours of ordering, we may allow you to cancel if we haven't purchased the supplies to complete your order. After 24 hours, there will be no cancellations. We DO NOT cancel orders that are over 30 days old (due to lack of information/response) or orders that we have started working on. Since all of my items are custom and made to order, there are NO REFUNDS. If we made a mistake, we will gladly fix/replace your item as soon as possible. Please report any problems with your order within 3 days of receipt of the item. We take great care to follow instructions exactly as they are written in our conversations or invoice so please double check you are providing the monogram initials in the correct order and have followed the numerical ordering instructions of each listing, respectively. The item is yours to keep if any of the information was provided incorrectly. Lastly, there are no refunds on shipping charges. We ship via USPS or UPS. All orders over $50 will be shipped with insurance. I CANNOT BE RESPONSIBLE for products that are damaged OR lost in transit so additional insurance is highly recommend. All products are packaged well to withstand shipping. Bubble wrap & tissue are used as well. However, there are occasions when things break or are damaged due to the carrier handling the package incorrectly. This is beyond our control and your control, but we cannot be responsible for this. For orders needed guaranteed by a certain date, please contact us prior to ordering with the date needed and zip code so that additional shipping costs can be applied to your order. Again, we CANNOT BE RESPONSIBLE for items lost in the mail with the post office or not arriving by a certain date. Most items are custom made to order, and they are rarely ready to ship. Please allow sufficient time to receive your product. We understand that some items may seem to be very quickly processed but you must consider the workload of orders placed before your own. Can I purchase multiple items at once, or do I need to order them separately? You can purchase them all together! Just add what you need to your shopping cart, then at checkout click the Blue "Keep Shopping" button to go back inside of our shop to add more items. Shipping will be automatically combined and discounted once the items are in your cart. Where do I leave my personalization information? There will be a message box on your cart page where you will be able to write all personalization options. Remember that if you would like a monogram it should be written in the order you would like it to appear. 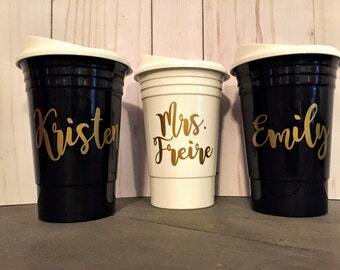 Traditional monogram order is first initial, last name initial, middle initial. We ship in 3-5 business days (sometimes sooner).